Dave Carpenter, Personal Finance correspondent for the Associated Press, tried this week to list a few important agenda items for retirees to “resolve” to accomplish in the new year. Among them is to investigate long term care insurance options. We couldn’t agree more – there is no greater risk to one’s retirement portfolio than the need for long term care. I would also add that pre-retirees are the ones most able to take advantages of low premiums and high acceptance rates. In fact, couples who plan ahead wisely can have premiums much lower than what Dave suggested for the exact same coverage. Since LTC is such a big part of the retirement agenda, it should be explored as soon as retirement planning goes into full-gear. Thanks, Dave! An article featured this past week in SmartMoney magazine describes why long term care coverage is necessary and appropriate for anyone who is concerned about the costs associated with changing abilities due to age or illness. Even for those who may not be able to afford a “Cadillac” plan, some protection can help to secure lifestyle, remain at home, and protect assets. After all, every dollar of coverage is a dollar that a family does not have to provide, either in the form of direct caregiving or hiring caregiving services. LTCI Watch: Will the Grandchildren Have First Cousins? | LifeHealthPro. 2011 Walk to End Alzheimer’s Kickoff! We were pleased to enjoy such an inspiring luncheon with those who really make this annual walk such a success! Thanks to Cindy Lowery and Amy French from the local association! One of the great things about the Alzheimer’s Association is the chance to hear the stories of such great people. This is a family with whom Gail had a wonderful conversation. The family’s matriarch, Betty Tate, cared for her husband after his Alzheimer’s diagnosis. She recalled going from a large world living with a man who served his country in the military and operated a large cattle ranch to the very small world of the Alzheimer’s mind. It was beautiful to see how supportive her family was in her efforts to support the Alzheimer’s Association in his memory. 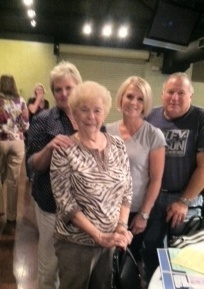 Betty Tate and her family. People on Medicare with supplementary insurance, known as Medigap, need to know that many in Congress are proposing that changes be made to their plans as part of a deficit reduction package. The premise of the proposed changes is that those with Medigap coverage are more likely to use their Medicare benefits. Therefore, higher deductibles and co-pays will discourage unnecessary medical care. People have purchased Medigap coverage to be responsible – they wanted to have predictable health care costs at an age when incomes are largely fixed. In my opinion, that sort of prudence should be celebrated in America – not punished. Congratulations and thanks to Representatives Chris Smith (R-NJ) and Ed Markey (D-MA) for introducing the Alzheimer’s Breakthrough Act, which will raise the focus of national funding toward finding treatments for Alzheimer’s that will cure the disease or slow or stop its progression. “According to the Alzheimer’s Association’s 2011 Alzheimer’s Disease Facts and Figures report, total payments for health and long-term care services for people with Alzheimer’s and other dementias amount to $183 billion, with Medicare and Medicaid making up the overwhelming majority of these costs. In fact, for every $28,000 Medicare and Medicaid spend on care for individuals with Alzheimer’s and other dementias; the NIH spends only $100 on Alzheimer’s research. Money And Life Changes — Special Report — Long-Term Care Hits A Nerve – CNBC. Actor Speaks Out About the Tragedy of Early-Onset Alzheimer’s. Excellent Video that Sums Up the Challenges and Hopes in the Fight Against Alzheimer’s. Please take a moment to read this message. I want to let you know of a tragic accident involving my niece and her beautiful family. On Christmas Eve, my niece, Trina Haxton (29), and her husband, Paul (30), were driving with their two daughters, Lyndsey (6) and Hayley (4) to visit Trina’s mother (my sister). Less than a mile from her mother’s house, they lost control of their car. It rolled several times, finally landing upside down in a ditch. Paul was killed instantly and Trina sustained severe spinal chord injuries. Miraculously, the girls survived with only minor bruises. No one witnessed the accident, but a neighbor heard the girls crying for help and was able to get the girls out of the car and save Trina’s life. Trina was air-lifted to the University of Maryland Medical Center where she underwent emergency surgery on her spine and is currently in critical condition. She suffered such devastating injuries that she will likely be a quadriplegic. We are hopeful that she will be able to breathe on her own. Paul’s New Year’s Eve funeral was attended by hundreds of friends and family members but not by his loving wife. Fortunately, they were able to videotape the funeral so that Trina can watch it when she is conscious and healthy enough. She has not seen her girls since the accident. The girls are safe and staying with my sister, Trina’s mother, in Delaware. My sister was nearing retirement and will now care full-time for her daughter and two granddaughters. As you might imagine, Trina is facing a lifetime of devastating medical costs. They are a loving family. Before the accident, Paul was a devoted father who worshiped his girls, and Trina was a dedicated mother who stayed home with them. Now, she faces an unimaginable battle. I am asking you to consider making a donation to help them care for the girls and provide ongoing care to my niece, who may never be able to hug her children again. For all the fun runs, 5Ks, bake sales, and office pools you’ve ever given to, please consider this request. Perhaps you can make a donation in thanks for your own personal blessings. We are heart-broken and hoping for a miracle. I am also attaching a link to a video with some pictures of my niece and her beautiful family. Please feel free to forward to anyone whom you believe might be moved by this story. Study examines phenomenon of women caring for ex-husbands. Happy Birthday to a L&A Star! 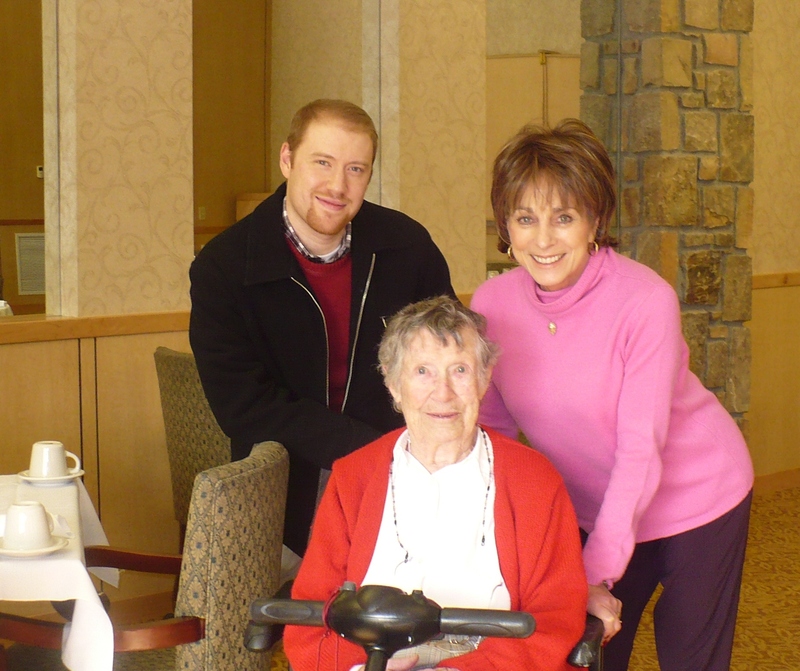 We recently had the great pleasure of celebrating the 95th birthday of our client, Harriet “Pat” Gagne. Pat is an inspiration to all who wish to age with dignity and grace. Being witness to a near-centegenarian with a strong voice and quick wit is an inspiration to all. We enjoyed watching her blue eyes sparkle as she shared with us some of the stories of her life with her husband and children. Pat lives at the independent Alexian Brothers community on Signal Mountain with her adopted cat, “Meow”. We have been pleased to call her a client for over a decade, and she cannot say enough about the comfort and peace of mind she receives knowing that she can maintain choice and independence should when her health declines. We look forward to celebrating her 100th birthday soon! Wanna Stay Home Sweet Home? Better Make that Home Safe! Believe it or not, the bathroom is far and away the most dangerous room in the house. This is true for people of all ages, but especially for seniors and those with movement difficulty. Here, in this article from IM blog, are the top 5 household items that can keep your bathroom from becoming an obstacle course:http://imblogonline.com/sort-by-room/bathroom/top-5-bathroom-items-to-make-life-easier/ Check it out! Financial Guru Terry Savage Lists Weighing LTC as One of the Top 7 Things to Do in 2011. Survival and Recovery: A personal financial strategy guide to 2011 – Chicago Sun-Times.